In December last year, the world lost one of the last of the great rock n’ rollers. Lemmy’s death marked the passing of an era that will likely not be repeated. The release of this DVD was meant to be just another live document, but it now stands as the last recorded performance from a colossus of heavy rock, and because of that it will likely attain a greater status that it possibly deserves. It isn’t that the performance or the footage is disappointing – on the contrary, both are excellent. But if this hadn’t been filmed only a month before Lemmy’s death it would probably just be filed alongside the myriad of other live albums and DVDs. 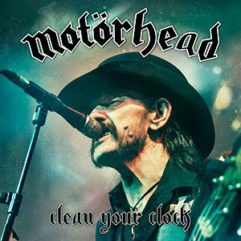 The production is sharp and deafening, just like a Motörhead concert should be. From the outset, as they explode into ‘Bomber’, they are on the money – loud, fast and locked in tight. But the HD digital also makes it very clear that Lem is very old and not at all well. Gaunt and frail, his once booming rasp reduced to a sometimes barely audible croak, it’s clear that even if he hadn’t passed away, Motörhead’s day were numbered. In short, he looks terrible. He can still play though, there’s no doubt of that, and like the battle-weary road warrior he was he leads his troops through 15 ear-splitting ‘Head classics without putting a foot wrong even though his voice is totally shot. His loyal sidemen get their chances to shine too of course, Mikkey Dee with an epic drum solo in the middle of ‘Dr. Rock’ to honour Philthy Animal Taylor who had died just the week before. Then there’s Phil Campbell. In Lemmy’s shadow for 30 years, in any other band he would have superstar status, and this DVD shows why. Campbell plays all over this, effortlessly wringing out guitar carnage throughout the show while barely raising a sweat as he cruises the stage. If the sight of Lemmy as a corpse-like rake is difficult to behold, Campbell is a joy to watch. The various formats of the soundtrack with gatefold vinyls and what have you might make this great for collectors, but seeing Lem in such a poor state and knowing he had only weeks to live when this was captured makes Clean Your Clock a pretty depressing experience regardless of the power of the tunes.